reaffirmed the status INDUSTRY LEADER 2014 and ENTITY OF THE YEAR 2014 according to “Accounting and auditing activity”. the status ENTITY OF THE YEAR 2013 in accordance with the relevant KVED “Accounting and auditing activity”. confirmation of the status «Entity of the Year 2012» according to the field-specific KVED “Accounting and auditing activity”. recognition among TOP 10 leading auditing companies of Ukraine and gaining a status Reliable Business Partner based on the results of the survey "TOP-10. Solutions for business". Active brand-promotion and popularization of the Global Alliance Praxity in the Ukrainian business environment. entering the international alliance of independent accounting and audit firms Paxity. occurence of the three industry leaders for the rating «Рi-rating of audit and consulting companies, 2006». 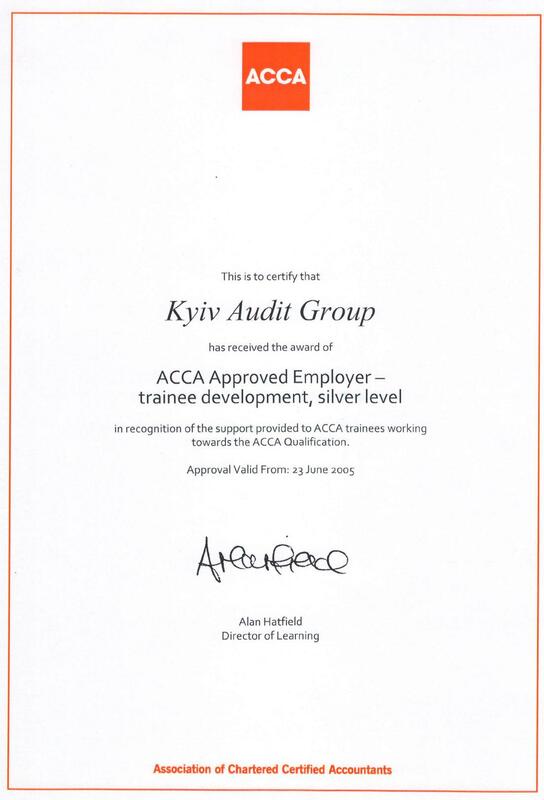 reorganization of the Company into a limited liability company “АF “Kyiv Аudit Group”. initiating and direct participation in establishing the Ukrainian Association of Certified Accountants and Auditors (UACAA). entering the international association of independent auditors Moores Rowland International. conducting an active marketing efforts to call in new potential clients. providing services of accounting automation. obtaining license to provide legal services, legal services for entities, providing reciprocal offsetting. development and implementation of the own software solution “Tax accounting and auditing at banking establishments”. audit services for business entities and banking establishments.